The Spanish name for oilbird is guácharo, meaning "one who cries." Oilbirds can be noisy. If people invade their caves, the birds will shriek or squawk loudly to warn other oilbirds and frighten the invaders. The oilbird family is social, and colonies, groups of birds, live together in caves. 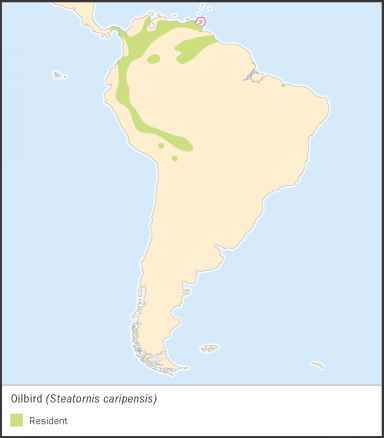 A large cave in Caribe, Venezuela, is said to house about ten thousand oilbirds. A protected population lives in Dunston Cave in Trinidad's Asa Wright Nature Centre. The center tracks the bird population by doing a bird count several times each year. The bird census in November of 1998 was 119 adults. In June of 2003, there were 120 adults, twenty chicks, and two eggs. The following December, the center counted 154 adult oilbirds. Oilbirds become active at twilight, and the colony flies out at night to forage for food. Birds usually look for fruit in pairs and groups. Their vision is strong enough to hunt for food at night. However, the birds rely on sound to guide themselves inside dark caves. rate of ten to twelve clicks per second, with the number of clicks increasing as oilbirds get closer to an obstacle. Oilbirds know to click faster because they listen to the echo of the click as the sound bounces off surfaces like walls and rocks. Their brain compares the echo with the sound of the original click. The brain analyzes how close the echo is, and the birds adjust their flight so they will not crash into something. This navigation system, called echolocation (eck-oh-loh-KAY-shun), is also used by porpoises, whales, and bats. During the day, oilbirds roost, rest in caves. Oilbirds are thought to be monogamous (muh-NAH-guh-mus), with a single male and single female bird staying together permanently. The two birds roost together on flat surfaces like ledges. Oilbirds often breed during the rainy season, but this may vary by location. In Venezuela's Caribe Cave, females lay eggs in April and May. The timing is believed to be connected with the abundance of laurel tree fruit. In Trinidad, the population of nestlings, birds without feathers, is highest in May and June. Breeding oilbirds build nests far inside caves and away from predators. Nests are usually on ledges located 33 to 66 feet (10 to 20 meters) above the floor of a cave. The oilbird nest resembles a saucer and is made of material including regurgitated seeds and fruit pulp. Birds use their saliva as a glue to hold the nest together. Female oilbirds lay a clutch of two to four white eggs. 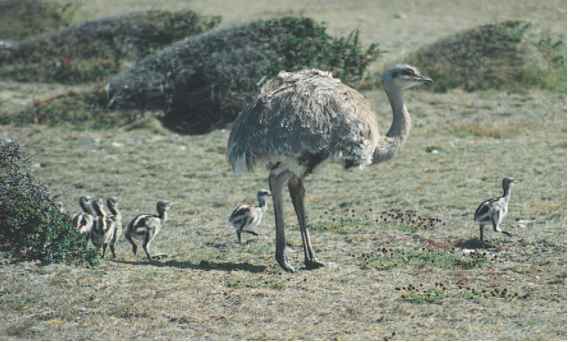 Both parents incubate the eggs, sitting on them until they hatch in thirty-two to thirty-five days. The chicks weigh from 0.4 to 0.5 ounces (12 to 15.5 grams). They are born with their eyes closed and have few feathers. Parents feed the chicks fruit, and the young birds become plump. They weigh almost twice as much as adult birds at seventy days old. The nestlings have feathers, but their tails and wings are smaller than adults. At they grow into adulthood, their feathers develop and they lose weight. Young oilbirds leave the nest when they are 110 to 120 days old.